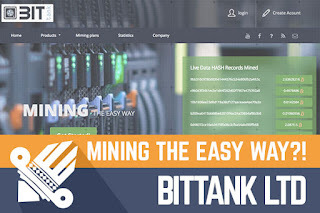 DavidNews HYIP blog - News & Reviews: BITTANK LTD – Mining the easy way?! BITTANK LTD – Mining the easy way?! Today I’m reviewing another cryptocurrency inspired HYIP called BITTANK LTD, which has joined Sticky Listing on DavidNews.com monitor 7 days ago. According to information provided by admin on BITTANK LTD website, the program launched at the end of May 2017. Now I have reinvested into the program $360 and will keep you informed about its performance. What is interesting about this program - it is somehow related to other HYIP, which might be confusing for some potential investors. However, I will go more into details in the following paragraphs. Keep reading to find out more. What is Bitcoin mining, some may ask? You can skip this paragraph if you are already familiar with it. We should begin with a term miner, which is a person that verifies newly generated Bitcoin transactions. Later this information about the latest transactions can be seen on the Public Ledger. Why is mining needed? Mining process gives value to the coins. Moreover, miners are rewarded for doing it. I’m not familiar with the potential profit and how much time it requires to make a profit from mining. However, there is such industry and there are people doing it. From the website of BITTANK LTD, I understand that they are doing a mining of various crypto currencies. Not just Bitcoin. I already mentioned that there is some confusing fact about BITTANK LTD. If you open their Facebook profile or YouTube account from the main navigation of the website, you notice there is a reference to a different HYIP called Matrixbit Club. On the company biography page of BITTANK LTD, there is a reference to Matrixbit Club as a partnering program. However, it’s very confusing because YouTube testimonials are not about BITTANK LTD project. On the Facebook account, the communication about the later HYIP begun in June 2017. On one hand, I understand the practical side of it, because you can easier reach a large audience on social media from the existing profiles with 9 thousand likes. On the other hand, it looks to me like admin or a group of admins has decided to launch the second HYIP. Why? I believe he or she might have their own reasons for doing so. Another thing I would like to point out is the fact that the first discussion on the forum about Matrixbit Club I could find was posted May 2017. This makes me think that the project has been a sleeper for 1,5 years (starting November 2015). BITTANK LTD has 3 mining plans: simple, standard and advance. Minimum deposit varies from $5 in the first plan and up to 1950 in the third. Interest rates of these plans vary from 0.96 to 2.16%. I believe it’s better than unpredictable floating rates. Most likely the plan number one is the most attractive due to its minimum deposit. $200 deposit in this plan would reach the break-even point after 105 days because the initial deposit is included in the payments. Minimum withdraw is $1. Of course, this plan is a long-term investment because it would make a reasonable profit at the end – after 365 days. Nobody can predict the performance of this HYIP in the following days, weeks or a year. Bitcoin mining sounds legit to me. However, most of the stories HYIP admins create are looking totally fine for a random web user. In my opinion, all this information must be examined in the context with facts we can find about the project. BITTANK LTD looks to me like a second breath project with a goal to attract more investments and diversify channels. Why there wasn’t enough with one program? Don’t ask me. Moreover, plans are beneficial only in the long term and I believe that 1,5 years for any HYIP is a big deal. As usual, I’m here to collect information and share my personal thoughts, not to recommend investing in any project. Therefore, if you ever decide to make any investments, don’t invest more than you can afford to lose! Investment plans: 0.96% up to 2.16% daily (hourly payments) for 365 days, initial deposit included in the payment.